I recently helped a client with a laptop that had suddenly become agonizingly slow to start up. The Windows XP loading screen stayed up for longer than normal, and it took several more minutes after that for the desktop to load and be usable; over 7 minutes total. Any hard drive intensive programs ran extremely slow. I ran hardware diagnostics to rule out a hardware problem, then started looking for a software solution. Process Explorer showed hardware interrupts stealing 20 – 80% of the CPU. Some googling led me to the Winhlp.com post DMA reverts to PIO. 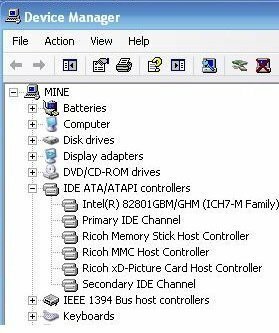 I checked Device Manager > IDE ATA/ATAPI controllers > Primary IDE Channel > Advanced Settings tab, and the Current Transfer Mode was set to PIO. After reading the Alternative Method—Uninstalling the Port section, I right-clicked Primary IDE Channel and clicked Uninstall. I clicked through the prompts, then rebooted. Windows booted much faster the next time. 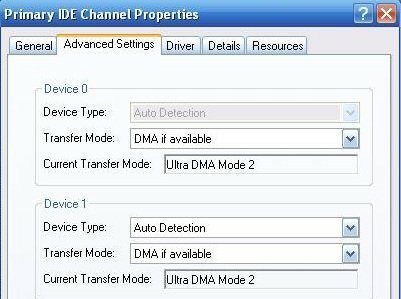 I checked the Primary IDE Channel, and it now showed the Current Transfer Mode as Ultra DMA Mode 2.